August 2015 – Steve Travis – President P.A.L. Steve Travis – President P.A.L. Can the death of a lion ultimately save the species? The world woke up with a start following the death of the well known Zimbabwean lion named Cecil. In an unprecedented outpouring of rage, his death at the hands of a trophy hunter circumnavigated the world and educated the masses into the “sport” known as Trophy Hunting. The most intriguing observation was the sheer number of people who were unaware this happens on a daily basis, particularly in South Africa. South Africa has over 160 Canned Lion Farms. These are facilities which breed lions with no regards for genetics or the welfare of the animals. In fact, welfare is the last thing on their mind. Exploitation from birth to death is the objective. Lionesses are forced into breeding. Cubs torn away from their mothers at a few days old, only to be petted and fed by tourists who think they are helping the poor orphaned cub. They are not orphaned, and any facility that tells you they are, are frankly lying to you. These are the kind of facilities that take in unwitting youngsters looking for a gap year experience by volunteering. In fact they pay good money for the experience whilst unknowingly abetting canned hunting. The problem with cubs is that they grow up. They become too boisterous to handle in an enclosed space, so they are moved into the world of “Walking with Lions” experiences. Here the dear tourist pays a lot more money for an experience where they walk in a controlled environment, carrying sticks and having their photos taken by the guardians walking alongside them. Do you truly believe this lion cannot kill you? Your stick will not protect you against an animal with an instinct for killing. However, the lions are so used to human interaction (since birth) they do not really see humans as a threat. Following their growth during the walking with lions phase of their miserable lives, they are put out to pasture to mature. I use the word pasture rather cynically as the reality is these lions are kept in caged enclosures, sometimes 30 or more lions in one pen, fed, watered and allowed to grow to maturity. In any other country the way these animals are treated would be legislated by animal anti cruelty laws. The respective SPCA would step in and ensure their well being, or close down the farms where lions are being reared on an industrial scale. This is where their worth really comes into fruition. A fully grown male, with a great shaggy mane will fetch anything up to £35,000 to a trophy hunter. This is the reality. This is the despicable act of lion farming. This is the rampant disregard for an animal with no legal protection, a government who sees lions as a commodity and a hunter who murders his prey in an enclosed compound (hence the canned hunting term, as the lion kill is in the can). This brings me back to Cecil. Yes he was murdered and the world was shaken awake. For decades numerous organisations (not for profit) have been trying to get lions the protection they need to survive and mostly to educate the world to this industry and stop the cruelty that ensues. In the blink of his dying eye, Cecil did this for every lion left on the planet. He died for the last few remaining wild lions, he died for every lion being bred on canned hunting farms and he woke the human spirit in all of us to stand up and say “We are not prepared to live a life where we allow an entire species to become extinct” Not on my watch! Education was they key. It is with most things in life. If you learn about something, you have a conscious awareness of it for the rest of your life. Every child is in wander when they learn natural history and the ways of our planet. Not everyone is an activist, not everyone can march for justice but every one of us HUMANS can make a difference one way or another by acting upon our knowledge and educating others along the way. We are the messengers, the silent prayers in the drifting winds, the ones with compassion and a love of life itself. These past few weeks have been incredibly frantic but worth every minute of every day as we take strides to helping protect the apex predator, the king of the jungle, the symbol worldwide of power, royalty, regal status and family bonds. As Global President of Protecting African Lions Foundation (PAL) I have been quite taken aback by the support and responses we have had across the globe. Our iconic PAL bracelets are being shipped worldwide to those wishing to express their solidarity, to make a difference, to show support and to drive the changes in laws worldwide that are required to protect lions. Our ambassadors work relentlessly building the relationships that can drive real change, our collective intellectual connectivity. 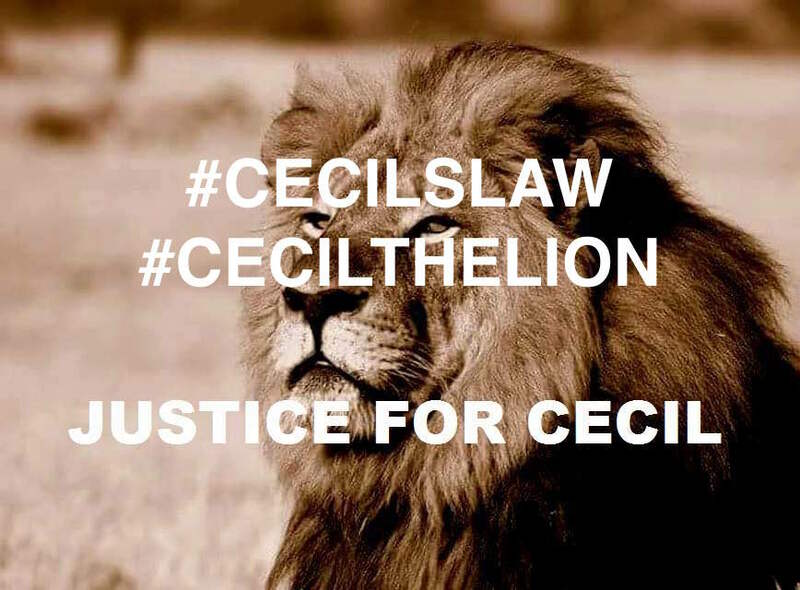 I am pleased to have initiated the campaign for #CecilsLaw which is now a global reference to any legislation passed in the protection of lions. Cecil has a legacy that will live on for generations to come and without him our planet may just have allowed the lion to fade into extinction. Support from the world of conservation, social media, sport, music, celebrity and government is helping drive #CecilsLaw and shall be the catalyst to ban canned hunting and trophy hunting on our planet.